Claude Monet was influenced by his extensive collection of Japanese woodblocks when he created his water garden. He liked all the bamboos, wisterias, water lilies or peonies he could see on them and wanted these exotic plants in his garden. He also loved the curved bridges which are so common on Japanese prints. 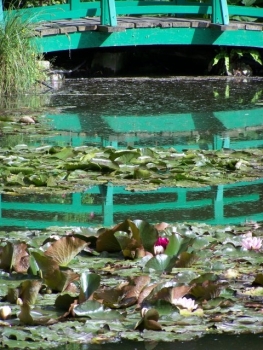 But although Monet knew pretty well the lay out of a Japanese garden thanks to his readings and to his neighbour American painter Lilla Cabbott Perry who had lived in Tokyo, he took poetic license. He didn’t intend to create a true Japanese garden. His bridges are much less bent than authentic ones, and they are green. In a true Japanese garden, they should be red.